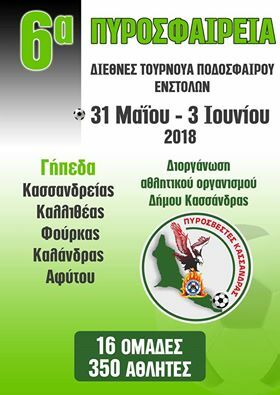 For the 6th year in a row, the Athletic Association of Kassandra in collaboration with the Fire department of Kassandra are organising the International Firefighters football tournament. 16 teams and 350 athletes will take part in the tournament. The tournament is dedicated to all those brave men and women that daily sacrifice their lives to save others. The games will take place in the villages of Kassandreia, Kallithea, Fourka, Kalandra, Afito.